Stop in and try our new home made breakfast cookie. 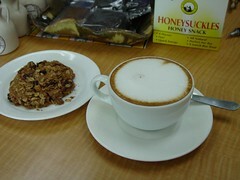 It goes great with a traditional cappuccino! Great for breakfast, but if you want it in the afternoon we won't judge you!